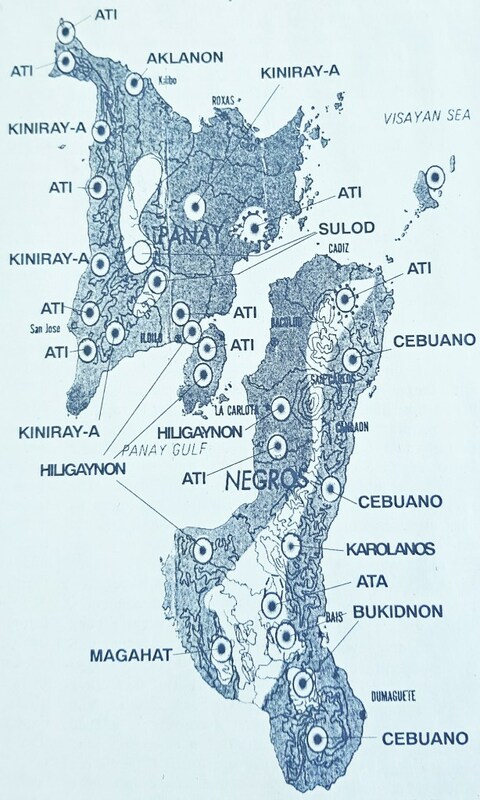 West Visayas is designated Region 6. Its lingua franca is Hiligaynon, but unknown to many, there are more speakers of Kinaray-a than of Hiligaynon. 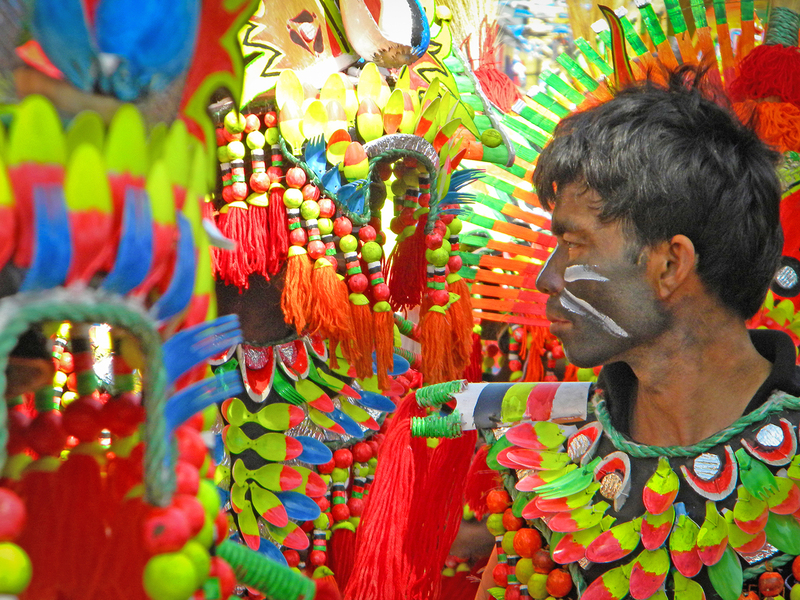 Kinaray-a in its many variants is spoken in all of Antique, all the southern coastal towns and central towns of Iloilo, and all the towns and hinterlands of Capiz. 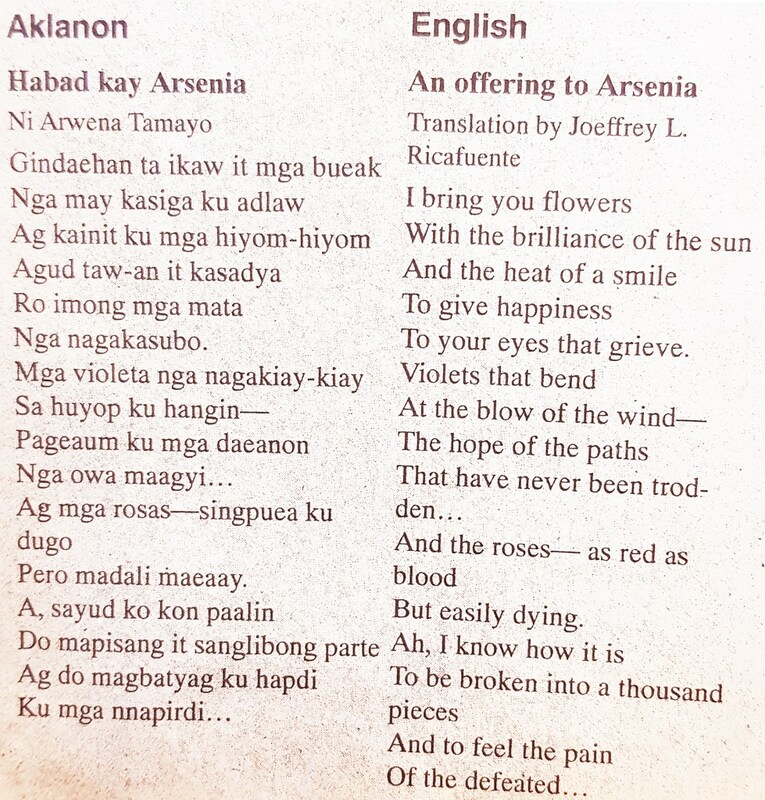 Aklanon, likewise in its various versions, is spoken in all the provinces of Aklan. Sadly, people usually lump these languages together as Hiligaynon. Worse, Kinaray-a and Aklanon are labeled as dialects, as if they were not capable of expressing the best in the minds and hearts of their users. The mother language of West Visayas is Kinaray-a. It must have been the language of the ten Bornean datus believed to be the ancestors of the West Visayans as recorded in the Maragtas and Panay epics. The ten noblemen allegedly got the island of Aninipay (the ancient name of Panay) from the Ati chief Marikudo in exchange for a headgear of gold and a necklace that touched the ground. Hiligaynon developed through the Chinese of Molo, Iloilo’s Chinatown. It is an early example of how colonial mentality works and how economic and cultural power can shape the language of power. The natives spoke Kinaray-a but instead of forcing the Chinese who controlled commerce to master the language of the place, it was the natives who accommodated the linguistic deficiencies of the foreigners. Thus the r in wara (none or zero), daraga (young woman), harigi (post), uring (charcoal), parigos (to take a bath), etc. became wala, dalaga, haligi, uling, paligos, etc. As Hiligaynon developed into a language of the elite, Kinaray-a lost its position and dignity as the mother language. It became associated with the soiled workingman of the farms and the highlands, of the vulgar and uneducated, of the muchacha and the sakada. Meanwhile, Aklanon also developed from Kinaray-a without Chinese acculturation. The most peculiar aspect of the language is its exotic /l/ sound. The so-called normal in Aklan, ulo (head), balay (house), dalaga (young woman), etc. is sounded with the tip of the tongue touching the upper teeth—Akean, ueo, baeay, daeaga, etc. There are words that have the normal /l/, but only Aklanons know them. The Hiligaynon bala (the Tagalog and Cebuano ba) is baea, but bullet is bala, not baea. The provincial capital is Kalibo, not Kaeibo, and there are towns like Balete, not Baeete, and Malinao, not Maeinao. The folk explanation for this is that Datu Bangkaya, the Bornean who appropriated for his territory the present province of Aklan, had a speech defect. He had a short tongue, and he lisped. So that their chief would not feel abnormal in his speech, his followers imitated his mangling of the /l/ sound. The 1986 EDSA revolution is a milestone in the literary history of West Visayas and the country. Three new writings emerged in the region: Kinaray-a, Aklanon and Visayan-influenced Filipino. It started with the new management of the Cultural Center of the Philippines (CCP), which encouraged the establishment of local art councils; subsidized conferences, workshops and publications; and awarded writing grants and venue grants at the National Arts Center (NAC) on Mt. Makiling. 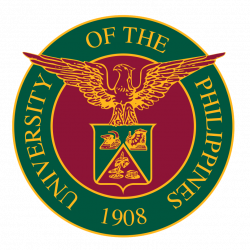 The first writing workshop I directed as CCP literature coordinator for West Visayas was at UP Visayas in 1987. The following year, the Sumakwelan, the association of Hiligaynon writers, won a venue grant at the NAC, with me directing the writing workshop. Poem included in the original March 29, 2000 issue. In the group were two writers from Antique—Ma. Milagros C. Geremia, a research assistant at UP Visayas’ Center for West Visayan Studies, and Alex C. de los Santos, a former student of UP Visayas and then a senior English major at St. Anthony’s College. Like any other Kinaray-a speaking writer before them, the two never thought of writing in their home language. Then during one of the discussions, I asked them: Why don’t you write in Kinaray-a? And they did. After the workshops, they swamped me with poems, all written in Antique Kinaray-a. I found them very good, some in fact extremely good. The two eventually formed Antique’s first ever writers’ group which they called Tabig. Liberating itself likewise from literary oblivion was Aklanon. Emerging Aklanon writers formed the Aklanon Literary Circle in Kalibo, spearheaded by UP Visayas librarian Melchor F. Cichon and UP Visayas student John E. Barrios, who took on my challenge to the Kinaray-a writers. Soon the Aklan issue of Ani was published by the CCP and launched in 1993. Cichon turned out to be the leading poet in his language and is the first Aklanon to publish a book of poems in his own language. Cichon and Barrios soon won writing grants from the CCP. More deliberate is my involvement in this radical, more calculated engineering of a brand of Filipino, which I believe is the intention of the Philippine Constitution. The national language is not Tagalog, but the natural fusion of words from Philippine languages and from Spanish, English, Chinese, Arabic and other foreign languages. Left alone, this fusion will take centuries. The development of language can be hastened with planning and judicious implementation. I believe the country needs a national language, and the sooner we junk English as the language of instruction in our school system, the better it is for our people. I resent, however, the manner Tagalog is being forced on us as the national language contrary to the constitutional provision. I have always believed that the national language will be something like the lingua franca of Davao City where I grew up. It is a natural combination of words from different languages, mostly Tagalog and Visayan and a sprinkling of Iloko and other northern languages, Chabacano, and the ethnic languages of Mindanao. So I proposed that the CCP create a category for Tagalog in writing grants, and the CCP eventually separated the Tagalog grant from the Filipino grant. 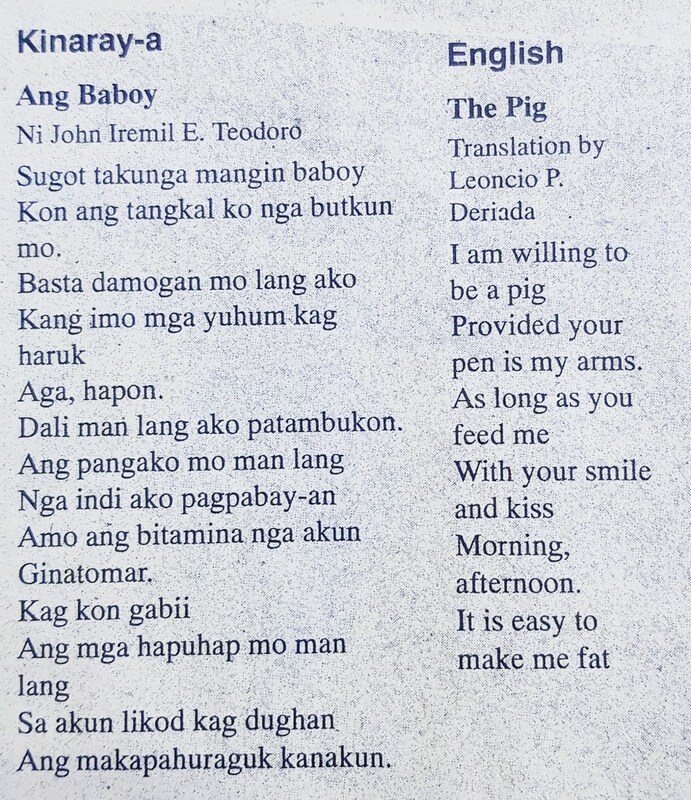 The first winner of the writing grant in Filipino poetry—in Filipino that was not pure Tagalog—was John Erimil E. Teodoro of San Jose, Antique, a product of my workshops. Teodoro won the first prize in the Gawad Amado Hernandez the very next year. The emergence of new writing in West Visayas—in Kinaray-a, in Aklanon and in a Visayan-influenced Filipino—has produced three new literary localities in the region. These three, combined with the more established writing in Hiligaynon and in English, make the literary geography of West Visayas an extremely visible landmark in the country’s mapping out of a richer, more diverse yet more defined nationhood. Prof. Leoncio P. Deriada was a multilingual writer and professor emeritus at the UP Visayas, where he was the head of the Sentro ng Wikang Filipino. He was also an associate of the UP Institute of Creative Writing and a Don Carlos Palanca Memorial Awards Hall of Famer, and was recognized as the Father of Contemporary Literature in Western Visayas.